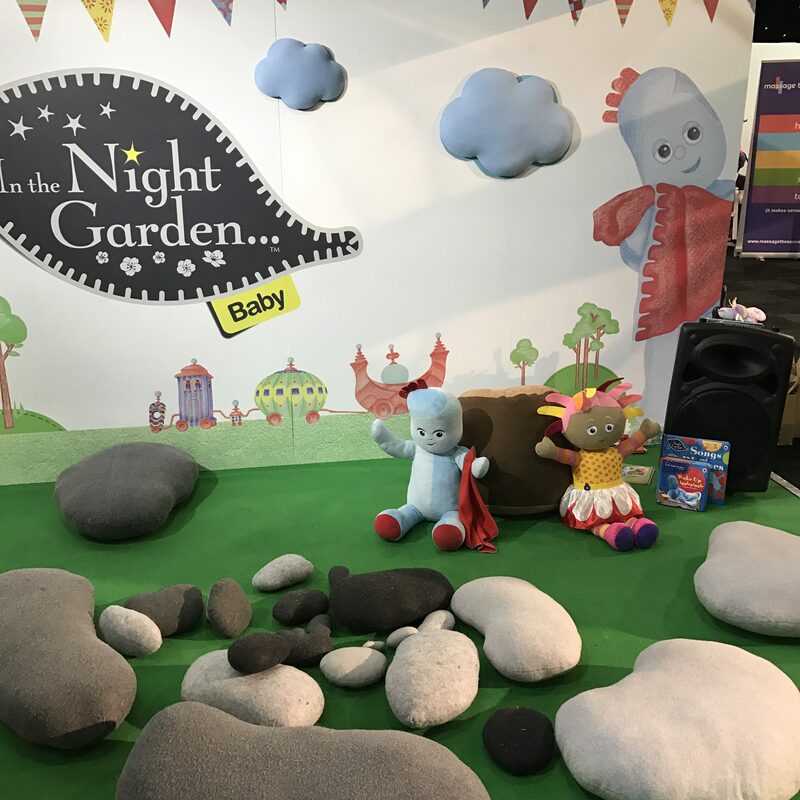 The stand was set up as a place for little ones to relax, with regular storytelling sessions taking place throughout the day and sleep expert Mandy Gurney on hand to provide advice to parents about their child’s sleep. 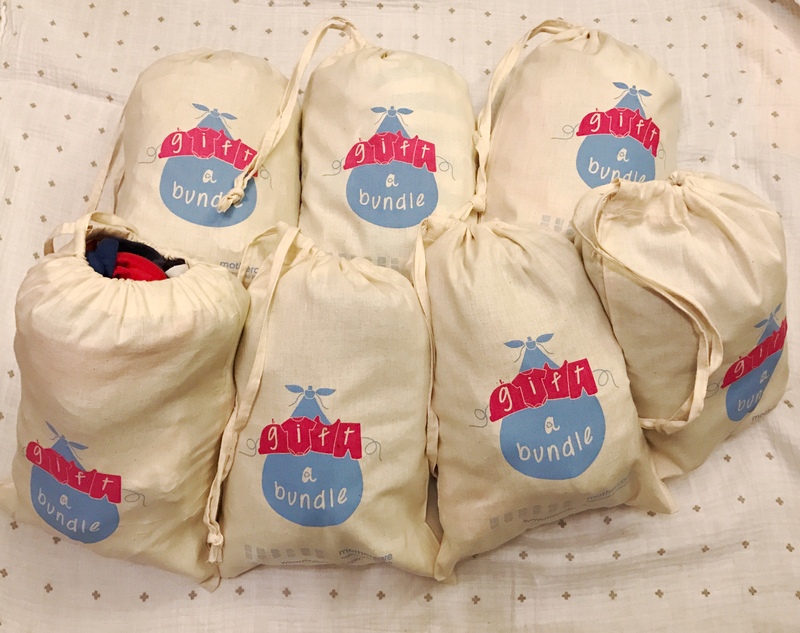 She’s the founder of Millpond Children’s Sleep Clinic and sleep advisor to In The Night Garden. I asked Mandy about Tall Boy’s sleep, not because I’m particularly worried about it, but because he still wakes up pretty much every 2-3 hours throughout the night and I was interested to hear her thoughts. As he’s got older I’ve seen some correlation between the amount of solid food he eats during the day and the length of time he sleeps at night so I have wondered whether his milk feed isn’t enough to fill him up all night. Certainly the best nights we’ve had have coincided with the days he’s eaten particularly well. Mandy asked me to outline our bedtime routine and I explained that we start with a bath at 7.00pm each night. Once Tall Boy is dry and dressed he has his bedtime feed in his nursery. Then, if he’s not already fallen asleep, which sometimes happens if he’s really tired, I read him a story before Tall Dad takes him in to our room, puts him in his grow bag, puts on wave noises from his sleep frog and rocks him till he’s calm, before putting him in his cot to fall asleep. I also explained that when Tall Boy wakes in the night he has his milk and then he will usually settle straight back to sleep. 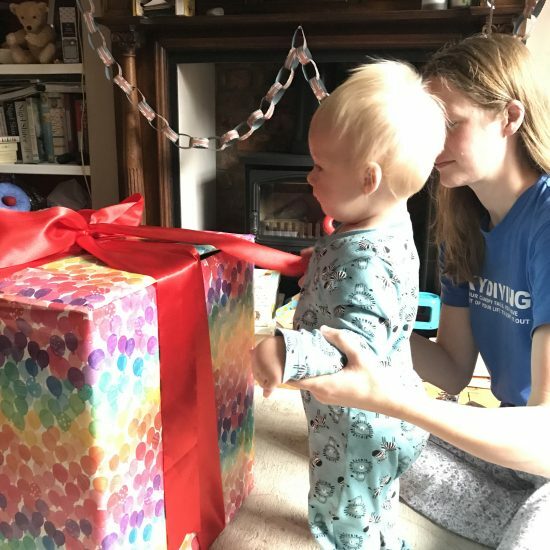 Of course there are nights when things don’t quite go to plan, such as when he’s teething, or doesn’t feel well and we have to manage a bout of screaming but that comes with the territory right? Feed him before his bath and top up after if Tall Boy is still hungry, to try and encourage him to go down awake and to increase the gap between food and sleep. Put Tall Boy down with a full tummy makes him more likely to wake up with wind. Gradually reduce the length of one night feed with a view to trying to drop it completely over time. If Tall Boy eats less at night it will encourage him to have a bigger appetite during the day. 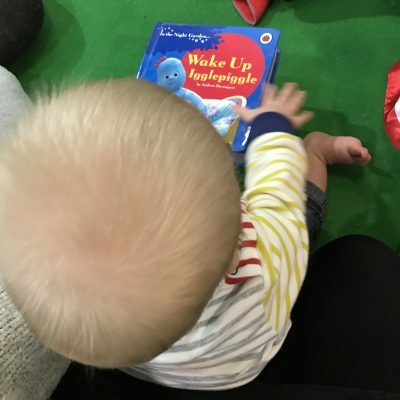 If I’m honest, I can’t see us changing Tall Boy’s sleep routine any time soon, but it’s useful to have some ideas in the bag if I ever feel that what we’re doing is no longer working for us – after all, I wouldn’t mind a bit more sleep eventually! While we waited to speak to Mandy, Tall Boy and I snuggled amongst the pebble cushions to read a story. 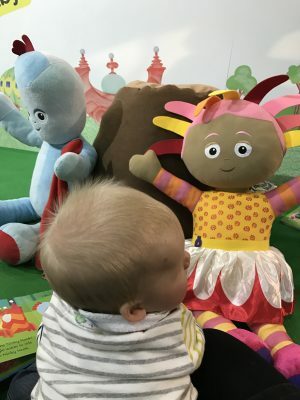 I introduced him to Igglepiggle and Upsy Daisy for the first time. 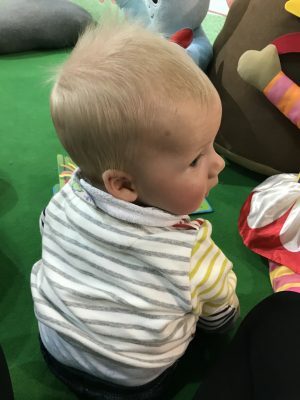 It was a lovely opportunity to give him some time out of the pushchair, which he put to good use practising his sitting. 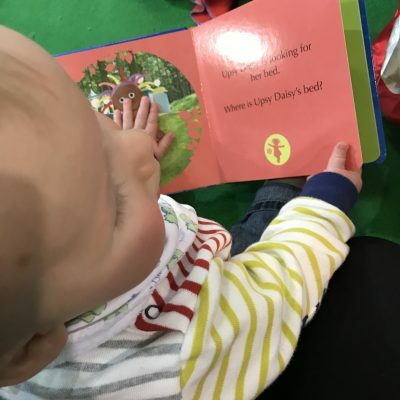 In The Night Garden gave me tickets to attend the Baby & Toddler Show but views, as always, are my own.